Make exciting, professional, and chic presentations with the Haiku Deck iPad app. You can sync presentations with the web app and your iPhone. As a bonus, the iPhone serves as a remote control for your iPad presentations. The Haiku Deck iPad app has intuitive interface that supports sophisticated, yet accessible tools to add photos, charts, and visual punch to your presentations. The only investment is your time and creativity with this free download from the iTunes App Store. The Haiku Deck iPad app requires an authorization by Facebook, Twitter, or email. The Facebook authorization requires basic profile information and list of friends access. For each presentation, you decide what type of public access is permitted, so there are no posts to your timeline without specific permission. 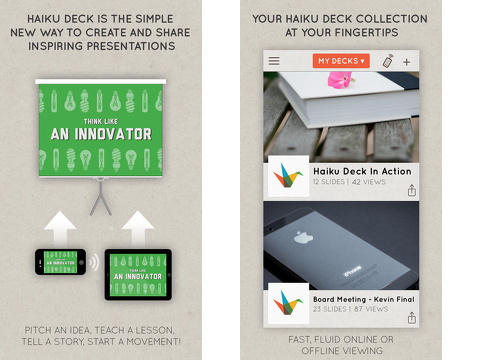 Your presentation, or deck, may be shared to the Haiku Deck social community, Facebook, Twitter, and email. Or, you may keep it private. The Haiku Deck is a social networking community designed to help you market your business, ideas, and projects. This is also an excellent tool for students to make presentations. There is a small learning curve to master every tool and feature with Haiku Deck, but there are enough simple features to make it accessible to a large group of users. A deck to introduce you to the tools and functions fills the middle of your screen. It is helpful and attractive, but trial and error is the best method to customize your experience. For inspiration, you can always touch the gallery icon to view featured and popular decks covering topics like SEO, Pinterest tips, elevator speeches, and Lifehacker-style inspiration. The first stop should be the account icon. You enter your name, Twitter handle, Facebook address, website, and email. If you plan to use Haiku Deck to sharpen your business pitches, you will want your contact information readily available. When you create a deck, you may select from filters or create your own. The filters are similar to iOS photography app filters. They have a cohesive color palate and feel. You may also customize every background and font, as well as add graphs, photos, screenshots, and more. Four icons in a vertical line on the left side of the screen give you tools – text, background, layout, and notes. A tap on the icon changes the interface and provides customization features that complement the selection you made on the left side of the screen. For example, when you tap background on the left, three new tools are listed horizontally – background, chart, and color. Another tap on background gives you a field to search for a public image to insert. You may also import your own image. When you tap chart, there are three different formats to create a chart. A tap on color gives you a chance to change the background to a solid color. Thorough, gesture-controlled options are available for text, layout, and notes, as well. There are several fonts, lists, bullet points, layouts, and public/private note tools to enhance your deck. The Haiku Deck iPhone app currently does not allow you to create presentations, but it does serve as a remote control for your Haiku Deck iPad app. You open both apps, and they automatically sync. You can switch slides on your iPad from a distance. It is a cool feature. 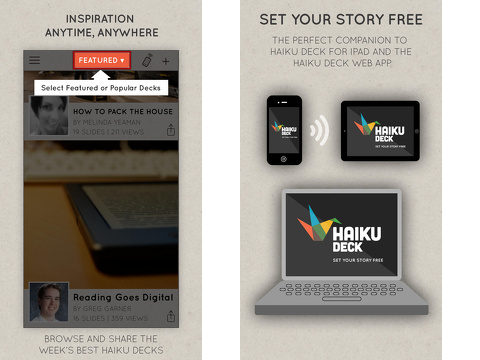 The Haiku Deck iPhone and iPad app is energizing and inspiring. It is a must-have for anyone who needs a knock-out presentation for school and enterprise. AppSafari review of Haiku Deck – Presentation and Slideshow App with Beautiful Charts and Graphs was written by Jenni Ward on March 6th, 2014 and categorized under App Store, Education, Enterprise, Free, iPad apps, Kids, Productivity, Social, Universal, Utilities. Page viewed 5616 times, 1 so far today. Need help on using these apps? Please read the Help Page. This app did not really work on my android.